← Happy belated birthday to Hum of the city! Earlier this week I found myself on the hook to pick up both kids because Matt was out of town. The complication was that I had to be in a Faculty Council meeting until 5pm. That meant I would have to run across campus to my daughter’s preschool, coax her out, then run across town to get my son at his after-school program before it closed at 6pm. I seriously considered hauling two car seats to my meeting and renting a car from the City Carshare in the preschool parking lot for this trip. Ultimately I decided against car share because I’d tried that once before and not gotten there in time—rush hour traffic is unbearable in the evening, and the after-school pickup line stretches back for three blocks. And after all, isn’t stuff like this what we got the Bullitt for? With that in mind, I parked the Bullitt outside the preschool in advance. Then I sprinted out of my meeting at 5:01pm, hauled across campus to preschool, collected all of my daughter’s art for the day, and dragged her out with promises to finish the story they were reading at home. We got to my son’s after-school program at exactly 5:30pm (in the rain). That beats my previous record by car by almost 20 minutes. And that is why we got the electric assist! My son was the first kid in his class to be picked up. Unfortunately I’d forgotten the speaker, so I had to listen to “99 bottles of beer on the wall” all the way home. Nobody’s perfect, I guess. I cranked the assist up to “high” for the ride home to spare myself. The New Wheel recently put together this drool-worthy BionX SOMA (also Pitlocked to the hilt). I would actually have gotten to him even earlier if someone hadn’t tried to steal my saddle. 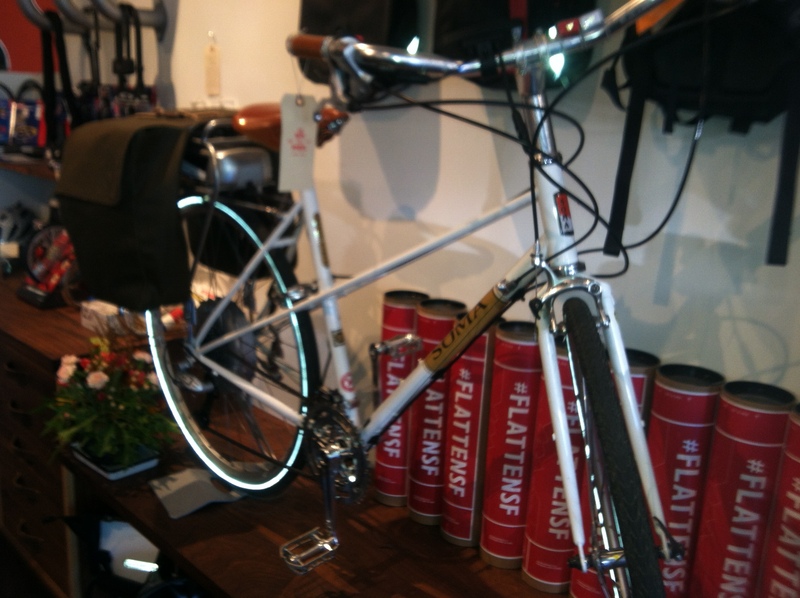 The Bullitt came with a very nice Brooks saddle, so nice that I never would have purchased it on my own. Saddle theft is epidemic in San Francisco, and thieves learned years ago how to clip the chains traditionally used to lock saddles to frames. However on the advice of a friend whose very expensive SOMA bike has survived being locked up at SF General for five years without being stripped or stolen, the first thing I did when the Bullitt arrived was to take it to The New Wheel, where they put Pitlock locking skewers on everything, including on the seatpost and under the saddle screws. Thanks to that, the thief was able to loosen the saddle screws but not remove them. As a result my ride was slowed by the saddle slipping back and forth, and that was really, really annoying. But I am gratified that my paranoia has paid off, and that I still have my saddle. Two thumbs up for the Pitlocks! The next morning, with the saddle screws re-tightened, I rode my son to school and came out to find the Bullitt being admired by two dads who work as contractors. When our PTA president rode up on his daughter’s bike, he looked at it and asked, “Will you give me a ride back to my bike?” and I said, “YEAH!” I didn’t get a picture, so you’ll just have to imagine me riding with a six foot tall man wearing a nice suit in the box. I can tell I’m getting better with the bike, because the prospect of carrying a heavy live load didn’t make me worry I’d dump the bike. And it was no problem at all. 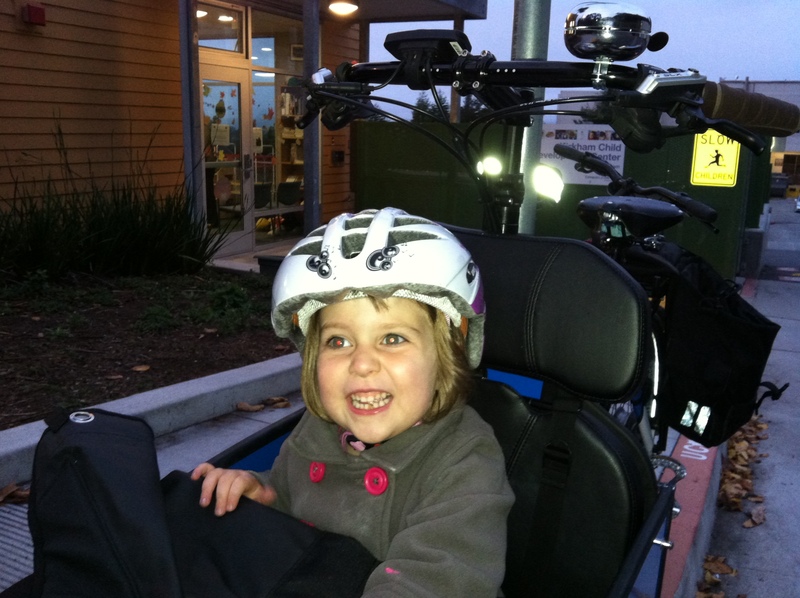 What was a problem was an earlier morning ride I took with my daughter in Golden Gate Park. For the first time in my life a driver nearly clipped me while passing, ignoring the empty road to the left to gun past me ON THE RIGHT. It was terrifying. When I saw the car pulled over less than a block ahead I pulled over to ask, “WHY DID YOU DO THAT? Passing me on the right is incredibly dangerous!” The driver turned to her husband in the passenger seat, who explained that she didn’t know the traffic rules and didn’t speak English. After he prompted her, she said, “Sorry! Sorry!” Okay, call me a xenophobe, but I feel that if you don’t know traffic rules or speak enough English to learn them, maybe you shouldn’t be driving. Although I’m glad that she wasn’t malicious, I suppose. It’s been hard to get pictures of the kids on the bike; they jump off and run to make faces at the camera. That, however, was an unusual event. In general riding the Bullitt is a daily party. When I ride people shout, “Cool bike!” and other riders pace me to ask where I got it. “I want one to carry my kids!” they say, and the parents at our kids’ schools say the same. I found the attention disconcerting at first, but I’ve found that as time passes that I like it. 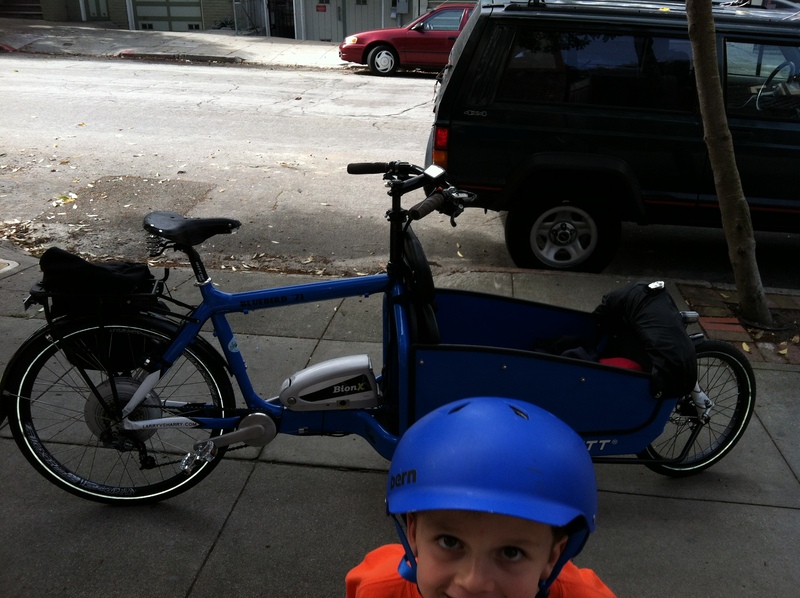 Our Bullitt is apparently a wildly compelling advertisement for family biking. And I never have to worry about not being seen by drivers. Admittedly the way that drivers drift out of their lane while staring with their mouths open can be unnerving, but hey, they’re not going to hit our bike—an oncoming car, possibly, but not us. It seems like we’ve spent quite enough on this bike, but this cover is pretty tempting. Last night I took my son home with groceries piled around him. He complained that the wind made him cold. I’m beginning to wonder whether I should have gotten the rain cover after all. It’s not like it rains much here in San Francisco, but the winds can be pretty brutal in the winter, and the kids are right in front taking the brunt of it. It’s not too late, I suppose. What would you do? I’d go cover! That’s why I got my little guy the windshield. He was getting windblown, taking the brunt of the cold air. I found I could ride longer with him happier if he was covered. First time commenting and fairly new to your blog, and I love it! We just finished putting a mutt electric assist bike together(iBert in front and trail-a-bike in rear) but it’s been great so far. Your blog is especially inspiring since I lived in sf a few years ago and am now in the easy bay. I am with you in your opinion of that crazy driver, too. Understand the rules BEFORE getting behind the wheel! Get the cover! Perhaps I’m not unbiased since it’s both rainier and colder up here, but back in our Bobike mini fairing days, the windscreen was most useful for wind generated from going downhill in the face. Very helpful at all times of year. Julian’s cover looked pretty tall–is it tall enough to accommodate a six-foot-tall adult? Or if not, is it easy enough to fold down and keep on the bike in case the opportunity to transport a full-sized person presents itself when you have the cover on? I say get the cover too…We use the cover on our bakfiets more for wind than rain. Having the cover makes getting out the door in the morning a little easier too– you don’t have to bundle up the kids in as much clothing. glad the Bullitt experience has been terrific, despite a saddle thief’s intentions. I’d get the cover. Apparently, the cover really helps with aerodynamics (and maybe dampen the 99-bottles-song for you). Also, warm and happy kids/riders, makes it more fun. 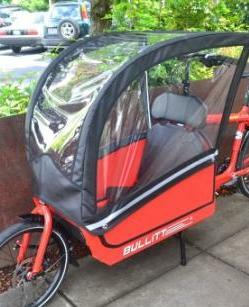 I got a Bullitt this summer and I am also considering getting the cover now that it is colder. My concern is that it seems really high over the handle bars. I was actually thinking that might be an advantage: my hands get cold in the wind! As for the cover, I’d probably go for it but that’s just based on our experience with the front of the bike seat for our daughter and the brutal winds here, which left her face streaked in tears and snot the last time we rode. That’s what made me switch to the trailer: built-in cover and wind/rain protection. I’ve added you to my blogroll and am excited to keep reading! Thanks for stopping by! I loved your parallel post about grocery shopping by bike! We do love the Bullitt, and given the universal sentiment from the internet, I’ve just ordered the cover. It’s pretty windy here too (thus far my kids have switched to facing me on colder days but that isn’t always ideal). I think those covers are a pain if you don’t live in a very rainy area. We use blankets in our Joebike Boxbike and do fine! I would probably get the cover. I am still dreaming of owning this bike and had to smile reading about the attention you get. I’m always hoping I will see the Bullit go by our neighborhood in the Presidio again so I can yell something out about how much I love the bike. We got the cover! It’s totally awesome. Also, we are planning a trip to Exploratorium over winter break–with luck we’ll see you along the way.